Women's Unique Gold & Silver Bangle : LOVE2HAVE in the UK! 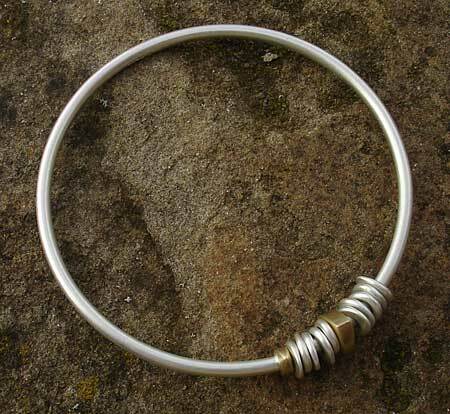 This particular women's unique gold and silver bangle is a solid sterling silver bangle handmade from a thick 3mm silver wire formed into a perfect circle. 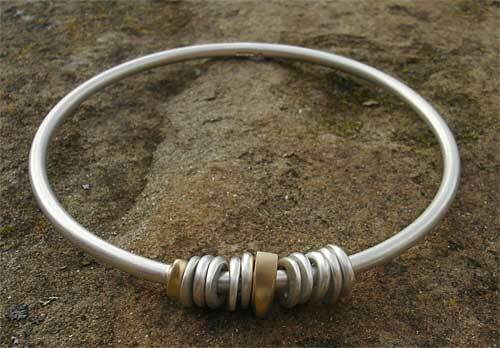 The bangle comes threaded with several silver jump rings that surround a fixed silver bead. The threaded jump rings freely move around the bangle making it a unique piece of designer jewellery for a woman. Also threaded onto the wire is a solid 18ct yellow gold bead that measures 9mm across. The bangle has an internal diameter of 70mm which we tend to find fits most women once slipped over the hand. It comes in an attractive matt finish. Metal(s)/Material(s) Available: 925 sterling silver and 18ct yellow gold.